In today’s rock review we’ll explore Olivine! Olivine is a mineral composed of Magnesium, Iron and Silicon. Many jewelry lovers may actually own Olivine in their collection without even realizing it because Peridot is also a variety of Olivine that occurs when Olivine melts and recrystallizes into a different structure. The gem is distinguished as a Peridot when it is vitreous and translucent. Chrysolite, coming from Greek for “gold stone” is also another name for Olivine. Olivine is typically green to brownish green although it also can have red or maroon banding. It gets it’s green tones from traces of Nickel or Chromium and it’s red tones from the oxidation of Iron. Olivine, along with Quartz, is one of the most abundant minerals on the earth’s surface and can often be found in igneous rocks and sometimes in metamorphic rocks. Dolomite and other types of sedimentary rocks can be transformed into Olivine when high heat and pressure geologic events occur. While many gems hail from locals all around the globe, Olivine has them beat since it’s reach extends beyond planet Earth. It’s also been found on the moon, on Mars and in comets within meteors, rock debris, dust and other samples that scientists have collected. Olivine can be treated with resins, waxes or oils to enhance its color. When purchasing Olivine jewelry, be sure to ask if your gemstone has been treated and if your jeweler recommends a specific method to care for it. A normal “as necessary “ cleaning routine is safe for Olivine. Just soak the gem for a few minutes in tepid water and mild soap solution, brush with a soft tooth brush if needed, and rinse again with tepid water. Finish by thoroughly drying the gem with a soft cloth. Olivine should not be left in water or left undried since it can be susceptible to water damage. The holiday season is here, and so are the office parties, family gatherings and formal occasions that call for a little something special to make the celebrations more memorable. When it comes to holiday style, glitter and sparkle are the staples of jewelry and accessories for women and girls of all ages. After all, we ladies do want to reflect the joyous atmosphere that surrounds us; glowing candles, shiny ornaments, and shimmering snowflakes. One 2011 trend that we love is cut gemstone briolette look. This style features vitreous (glassy) precious and semiprecious cut gems that have been wire threaded and wrapped to create a dangling or cluster look. Often the gems are cut on both sides, which is a fun change from flat back set gems. You’ll be sure to look fabulous from all angles! This design is perfect for pendants and earrings. It also lends itself well to movement which is fabulous if your holiday plans involve a dance floor, caroling, or maybe even ice skating. You can let your jewels swing and sway along with you as you glide and bounce to your favorite tunes. There are many gemstones that are ideal to coordinate with your holiday wardrobe colors. If you’re looking for something in the green spectrum, consider Peridot or Green Topaz. Peridot has a brightness that will cheer any ensemble. Green Topaz adds a richness and play of color that will keep you captivated as different viewing angles and lighting make the stone appear equally blue and green. Garnet is a lovely choice in the red family. It’s deep crimson tones have a depth that convey the opulence and warmth of the season. If frosty weather has you thinking in blues to complete your holiday look, Aquamarine or Iolite are unexpected choices on opposite sides of the dark and light spectrum that will ensure snowflakes and icicles aren’t the only icy favorites getting noticed. For those who dream in silver and gold, just like the beloved characters in our favorite holiday tales, Citrine with Sterling Silver may be a great way to bring some whimsy to your outfit. Whichever accessory you choose, you can’t lose if it brings that needed touch of shimmer and shine to your holiday occasions. They will add life to your memories and maybe even provide something special to pass down to future generations who will smile as they think of the many years of warm moments your heirloom jewelry has seen. Here is a perfect example from Layne Designs. All that glitters is not gold, which is true in the case of today’s gem the gold doppelganger, Pyrite or Fool’s Gold. Pyrite is actually a mineral compound of Iron and Sulfide. It can often be found in Quartz veins, coal beds and also as a replacement mineral in fossils. It is present in both sedimentary and metamorphic rocks. Although this mineral has been nicknamed Fool’s Gold, it sometimes can be found alongside real Gold or contain Gold traces within it’s crystalline structure when Arsenic is also present. When Pyrite is exposed to water and oxygen together, it can oxidize and has the tendency to turn a rust color, thanks it’s Iron content. It is opaque with a gold to brass metal luster and registers a 6-6/5 on Moh’s scale of hardness. When your Pyrite jewelry needs a little TLC, it’s best to just stick to mild soap and water, being sure to dry thoroughly with a soft cloth. Also, it’s a good idea to store it in its own box or compartment so it doesn’t scratch your other jewelry, since it’s pointy planes are fairly hard. 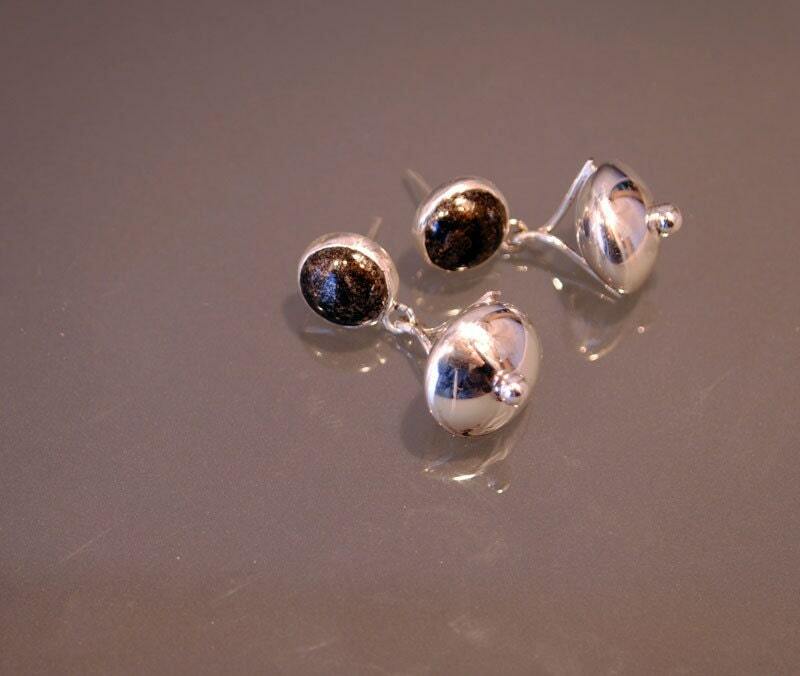 Pyrite comes from the Greek word “pyr” for fire. This is most likely because pyrite was used for quite some time as a counter part to produce a spark on steel, much like flint and steel. It was even used in early 16th and 17th century fire arms to create the spark that would ignite gun powder. It also was a component in early radio receivers that used crystal technology to conduct and receive radio signals. The Greeks and Romans also used Pyrite for jewelry because they believed the presence of the fire was contained inside the stone, making it a source of mysterious power. Pyrite is a great jewelry choice for those who have a creative bent. It is believed to open both the right and left sides of the brain, releasing imagination and creative talents. It also is thought to promote a connection between the subconscious and conscious mind. Today’s Rock Review features a “hometown” gem for those of us hailing from Pennsylvania, home state of Layne Designs Studio. It’s Chrysocolla! Chysocolla ranges from blue to green in color, often appearing in lovely sea foam or teal tones. 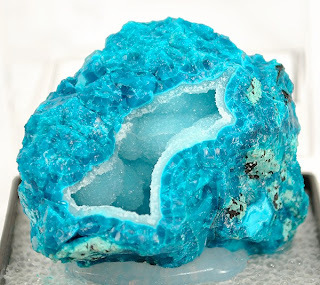 Because of its color, it’s sometimes confused for Turquoise, however it is a different gem altogether. It is a secondary ore of Copper. It forms in oxidation zones in veins of Copper ores over long periods of time as oxygen chemically changes the composition of the ores. In these veins it can form either as a crust or a rounded mass. Often, it forms along side or in conglomeration with other minerals such as Quartz, Limonite, Azurite, Malachite, Turquoise and Cuprite. That is why Chysocolla gemstone will often contain veins and traces of these gems as well. It registers a 2.5-3.5 on Moh’s scale of hardness and therefore should be handled with care. Pure Chysocolla is too soft for the everyday wear and tear that occurs in jewelry, however when it forms in the presence of quartz, it becomes hard enough to fashion into a beautiful cabochon. It can also occur in druzy form, yielding am amazing natural Robin’s egg blue color. The name for Chrysocolla comes from the Greek words “Chysos”, meaning gold, and “Kolla” meaning glue. This is because they used the ore to solder gold. A metal smith named Theophrastus is the first person to be credited with using the material in 315 BC. As its color alludes, gemstone healers believe Chysocolla to have calming and cooling effects. It can be used to treat nervous disorders and bring a sense of peace. It also is applied in the treatment of fevers, infections, burns or cramps. December’s Birthstone is the icy Blue Topaz. Topaz is a silicate mineral of aluminum and fluorine. It crystallizes in an orthorhombic crystal system, meaning it grows in rectangular prisms with rectangular bases. Pure Topaz is completely colorless. It gains it’s various colors from the presence of other elements that find their way into the mineral. Topaz is most commonly found in igneous rock deposits of Granite or Rhyolite. Blue Topaz achieves its color when it is heated either by a natural source or by a man made source. Natural Blue Topaz can be quite rare. Three well known shades of Blue Topaz are Sky Blue, Swiss Blue and London Blue. London Blue closely resembles the color of Sapphire. Not only is Blue Topaz a December Birthstone, it’s also the state gemstone of Texas. Topaz is also one of the stones mentioned in the Bible in Exodus 28:17 as adorning the breast plate of the high priest of Israel. Topaz gets its name from the Sanskrit work “tapas” meaning fire. Many ancient civilizations believed that Topaz had cooling properties, including the ability to cool a pot of boiling water. 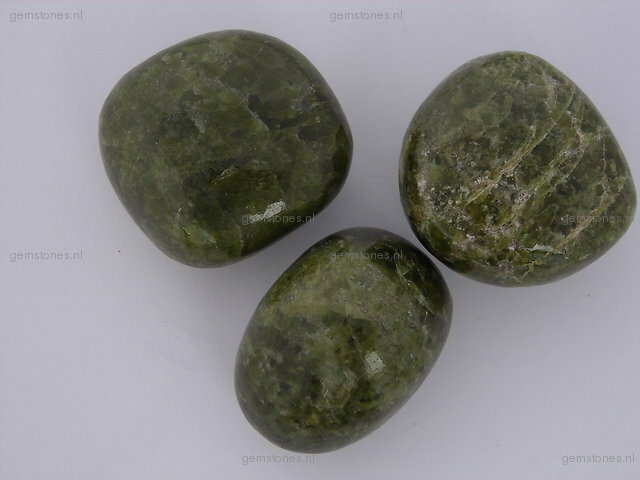 It’s also believed that this gemstone has a number of healing powers including the ability to cure insanity, poor vision, sleep disorders and asthma. Besides its use as a healing gem, today, giving a gift of Blue Topaz is symbolic of love and fidelity. What a perfect gift to give a loved one! I have a fascination with gemstones, and fossils. My collection of gems inspires many of my jewelry designs. My name is Layne Freedline. I am a metalsmith and jewelry artisan with a long time love for gemstones. Here you will find some cool tips and tricks from my studio, "rock reviews" featuring facts and myths about the properties of the stones found in my jewelry, as well as happenings and cultural events in the art and jewelry fields. I love shopping and living with handmade goods because it is good for the soul and good for the local economy, so join the movement and buy handmade!